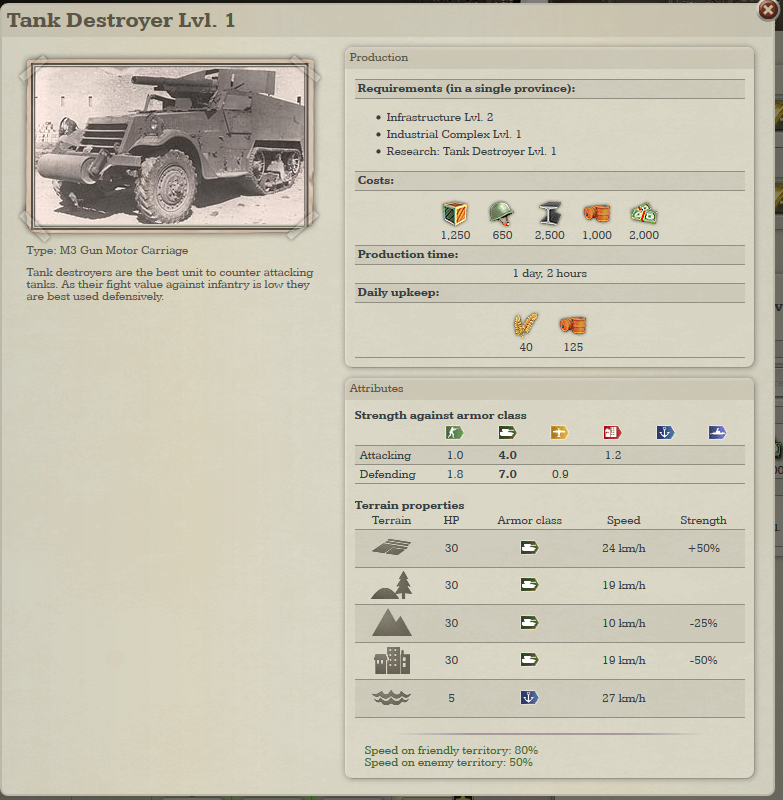 so what is the best unit to take down tank destroyers? I would use bombers unless the tank destroyer group has more than one anti air unit. Artillery mixed with tank destroyers or anti tank of your own would be my second choice. Rockets are handy if you have a stack that includes all of the above. 4. stand-off attacks with artillery or naval gunfire work nicely, too. a TD brigade. Also, note that TDs, like most other armored units, lose half of their offensive and defensive strength on urban terrain (i.e. cities), and that's a good place for an infantry assault, especially if the TD is not supported by other units. Of course, a TD unit on defense, like an anti-tank regiment, is going to be stronger and survive longer when it is embedded in a stack of other units that cover some of its shortfalls against attacks by infantry and aircraft. The post was edited 1 time, last by MontanaBB ( Jun 1st 2017, 10:52pm ). Light tanks and tank destroyers unsupported by other units? Also, note that TDs, like most other armored units, lose half of their offensive and defensive strength on urban terrain (i.e. cities), and that's a good place for an infantry assault, especially if the TD is not supported by other units. Just wanted to add that TD's, unlike most armor units, do not get their health slashed in half when they march into a urban city, which means that, even in a urban environment, it is still highly effective against other armor, more so, because other armor units will lose 50% of their health(minus mechanized, support, and other TD's), while it is still rolling at 30 HP with a level playing field on damage. @'NovaTopaz - When you talk about TD's, you may want to clarify that a bit. Tank Destroyers, as shown below, do lose 1/2 of their strength in cities. Anti-tank guns, which I assume you were talking about, do not. Just wanted to add that TD's, unlike most armor units, do not get their health slashed in half when they march into a urban city, which means that, even in a urban environment . . . .
Not exactly, NT. In urban terrain, tank destroyer brigades do lose have of their offensive and defensive strength against other units, but unlike other armor units they do NOT lose half of their hit points, so they're still relatively hard to kill. When most players refer to a unit's "health," they are talking about the unit's percentage battle-effectiveness or "condition" -- what we used to call "morale" (and many players still do). The unit's condition is not affected by terrain, but its strengths are, sometimes dramatically. That's why it is important to read and understand the unit type spec sheets. I'm referring to the health not decreasing in cities... Again, adding a important fact to what @MontanaBB said, that is relevant, because it means, even in city streets, it will take the same amount of time to kill it as in most other terrain, unlike heavy, medium, and light tanks, which do suffer a penalty to their health(so, instead of decreasing effectiveness by half, it's actually doing 1/4 because of the cutting of health(and by cutting, I mean the max health is physically reduced to half the normal value. Like aircraft only having 5 HP when being transported on land), while a TD only suffers the 1/2 to damage.). And your image has proved my point on the TD having the same health in urban terrain(IE cities). Edit: ... Yeah, not the best work I've done. Should have used HP(hit points) instead of health, because of that association with morale and the like. The post was edited 1 time, last by NovaTopaz: because it needed it ( Jun 1st 2017, 11:12pm ).
. . . forgive my noobyness . . .
FP, we were all noobs here. And we got less nooby by paying attention and asking questions. infantry/anti-tank guns are your (cheapest) way to go!